Bartolo Colon dominated the Braves last night, shutting them out over seven innings while striking out five. 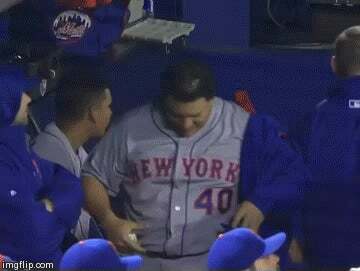 He also did this in the dugout. How Colon, who is now 40 years old and tipping the scales at about a billion pounds, is still an effective major-league pitcher is beyond explanation. But man are we glad that he's still out there doing his thing, because it means we get GIFs like this.